Details to follow as posting time permits, along with some info concerning the Equinox when relocated to Moscow and a couple of other world capitals in the news, and paying special attention to angular factors since they will have outlet for action. Since we remember the controversy, confusion, and deceit with which the Bush administration began, this chart may well describe some of the circumstances in which it will end. Bush is leaving the next globalist shill a lot of crud upon the plate, but watching the *Bolshevik propagandist in action as we’ve had 8 years to do, and seeing here that he’s determined to “be important” till the curtain lowers, it’s fairly safe to assume he’s not done strutting on the world stage just yet…still, one may assume that much of Bush’s agenda has been achieved and the NWO baton will be passed in Jan 2009. Sep 15 Update: notice dual Gemini on 8th cusp of Shared Resources, Debt, Insurance, High Finance, Credit, etc…sign of versatility and duplicity, with Moon posited in 8th house…and wherever we see the Moon in a horoscope chart, we know there are sure to be fluctuations and changes. Sun/Moon squares indicate bitterness and resentment at adjustments which must be made (losing one’s job can do that to anyone); the ‘good life’ is wanted but discipline for achieving it may be missing; this is an aspect of frustration which can cause domestic problems and quarrels due to a defensive attitude. As you know, Astrology gives info on many levels all at once, so with the Moon representing ‘the people’ in a national chart and the Sun as ‘the leader’ on one level, these factors apply to our situation politically, economically ($8th h/10th h = career), and domestically. But the Sun/Moon SQ also relates to partnerships/relationships with Sun as the male principle, Moon as feminine principle. There’s another square to the Sun with powerful Pluto conj 2nd cusp, another of the Money houses. Both the squares to the Sun as waning/separating, indicating an unconscious quality, but on another level to events or meetings just prior to Sepr 22. The Sun/Pluto SQ is the more recent of the two. Sun/Pluto squares indicate one with a powerful ego who is willful to a destructive degree; when pressure becomes intolerable, explosions occur which causes others to keep their distance. This sort of aspect causes one to strike first to gain victory, and has a chip on its shoulder as it prowls for an adversary; abuse of authority makes this ‘might makes right’ energy its own worst enemy. There is executive ability, however, but decisions are based on feelings rather than evidence. Now the Saturn/Uranus opposition is lining up – here it’s applying by 6 degr 3 minutes, so what may we expect from this aspect? Relating is done competitively even when there’s no reason for it. Great, huh? What the world needs now is love sweet love and we get this. Anyway, COMPROMISE is what’s needed but instead we get authoritarian officiousness which arouses resentment in subordinates who then set about ‘sandbagging’ those in charge…sounds like more revenge on the way. This is a “know it all” aspect that represents those who need others for stabilization because they’ve disregarded logic in handling affairs. In the collective, the Saturn/Uranus opposition can influence superiors to prey on underlings. 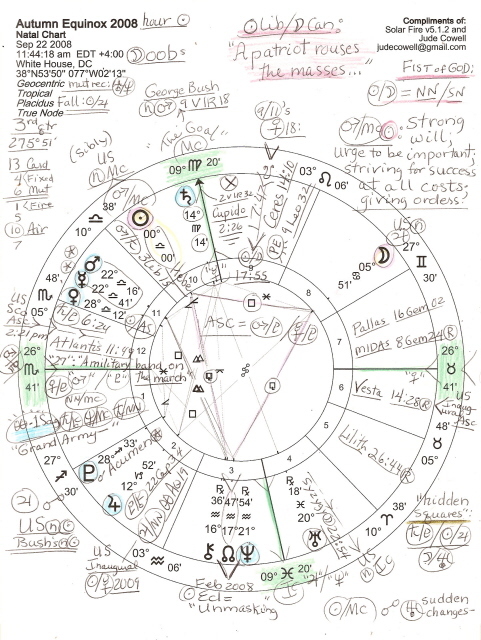 Now one more thing is that in the 2/8 Money Axis is the Moon already discussed opposite moneybags Jupiter 12Cap52 (his Station Direct degree – “A Fire Worshipper.”) Also, the 8th cusp is at the “Bankruptcy” degree of ’28Gemini’ – this is a very unstable 8th house, isn’t it? Moon opposite Jupiter is an aspect of self-indulgence and signifies those who are prone to making serious mistakes through believing what’s least emotionally painful; they are often deceived and discover their generosity has been bestowed on those who do not deserve it. And since the Moon is conj US natal Jupiter we see that the US is still under the Jupiter opposite Jupiter transit when resources dry up, and no one is impressed. If that doesn’t describe the economic turmoil now, I confess I don’t know what could – and in one ‘little’ transit! Jup/Pluto = Moon: desire to bring about social improvements; the ability to influence the masses by appealing to the feelings; emotional conviction guides a new start; establishing one’s new position with a gut feeling; a good psychologist. Well, that sounds fairly okay as long it doesn’t come under the “played like a fiddle” category of propaganda and emotional manipulation. But as you see, Jupiter and Pluto (together they represent: plutocrats, organisers; law and economic professors; speculators and squanderers – Ebertin) are parting from their Dec 11, 2007 Great Conjunction at 28Sag23 – within 10 minutes of where Pluto is for the Autumn Equinox 2008. Upsetting, disruptive Uranus 20Pis18 Rx is in 4th house which signifies domestic disruptions and confusing conditions (Pisc), and Saturn is in 10th h where he really hates public embarrassments…but it’s too late for that, isn’t it? Mars/Mc = Sun: self-promotion; the drive to be important; self-willedness; the power of attainment; procuring power for giving orders to others; overcoming resistance or obstacles. So…should I close with the Fist of God pattern? It’s highlighted on the chart, but not a lot is known about such configurations. I can say that there’s a fatedness here as the pattern focuses on the Sun/Moon square at its base and pointing at the North Node, the path. Sun/Moon = NN: adaptation; beginning of an association. Yet NN is at the ‘end of progress’ degree so I believe this makes America’s Progressed Full Moon part of the picture as the time when the US begins to retract rather than expand in the world. Expansion is made much more difficult when you’re broke! I have a sinking feeling about this election. It’s defeat snatched from the jaws of victory…again! All the ‘re’s, Monica. And with politics, Mercury is So Important anyway…statements, negotiations, contracts, SPEECHES, announcements, you know the list. Mercury Rx (you’re right!) will draw out all Mercury-ruled things from Sept and result in reviews, rethinking, rephrasing, re-planning…all of the above and voting issues as well since Nov 4 falls into the autumn season of this chart. hmm, so i guess you are saying that obama will not win the presidency and we will have more of the mcsame?